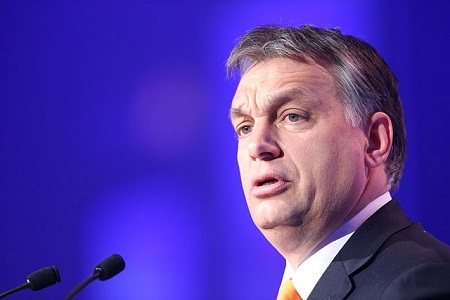 Viktor Orbán, Hungary's Prime Minister, once again spoke honest and true words at his speech on the 15th of March in front of the Hungarian National Museum in Budapest. As one of the last remaining politicians in Europe that is not afraid to speak out against political correctness, he called out all European nations to resist Internationalists in Brussels that dictate the forced mass immigration of millions of hostile Muslim men into peaceful, Christian European countries. Under the disguise of "humanitarianism", globalists and their naive, manipulated liberal followers intend the complete destruction of nation states. Their new war is fought with media control, brainwashing, threats, defamation and destruction of family values rather than tanks or Gulags, as the previous Soviet government did. To implement their vision of a "United States of America" - devoid of any diversity with its culture annihilated and their unique ethnicity destroyed, they have forced Europeans to accept their own demise, shaming them for patriotism and wanting to protect their families, borders, culture and future. He went on to say that young Europeans are waking up from their hibernation caused by an extended period of comfort as their very life and future is now threatened by conquering hordes of Muslims who see the land they arrive in as their own. As expected, he is defamed by the media as a "xenophobe" and "racist". Especially German, state owned media calls him "the shame of Europe" and a "violent hate speaker and mental arsonist". "Europe is not free. Because freedom begins with speaking the truth." "Today in Europe it is forbidden to speak the truth. Even if it is made of silk, a muzzle is a muzzle. "It is forbidden to say that those arriving are not refugees, but that Europe is threatened by migration. "It is forbidden to say that tens of millions are ready to set out in our direction. "It is forbidden to say that immigration brings crime and terror to our countries. "It is forbidden to point out that the masses arriving from other civilizations endanger our way of life, our culture, our customs and our Christian traditions. "It is forbidden to point out that those who arrived earlier have have already built up their own new, separate world for themselves, with its own laws and ideals, which is forcing apart the thousand-year-old structure of Europe. "It is forbidden to point out that this is not an accidental and unintentional chain of consequences, but a preplanned and orchestrated operation; a mass of people directed towards us. "It is forbidden to say that in Brussels they are concocting schemes to transport foreigners here as quickly as possible and to settle them here among us. "It is forbidden to point out that the purpose of settling people here is to reshape the religious and cultural landscape of Europe, and to reengineer its ethnic foundations. — thereby eliminating the last barrier to internationalism: the nation-states. The full translated transcript can be found here.